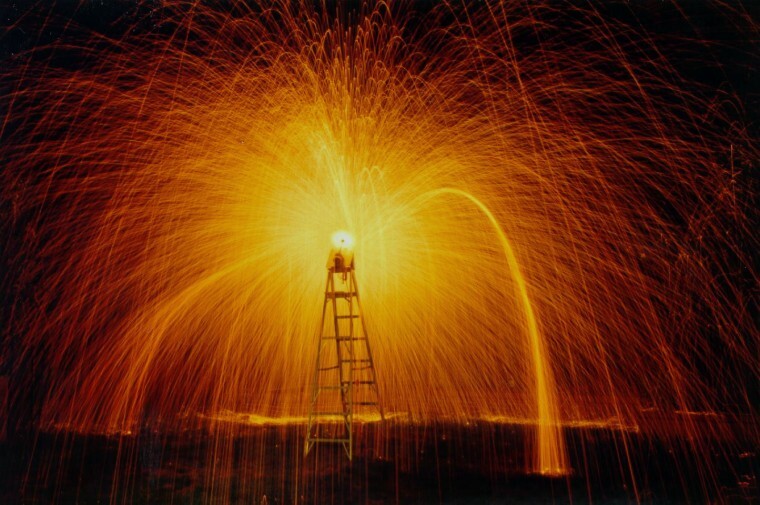 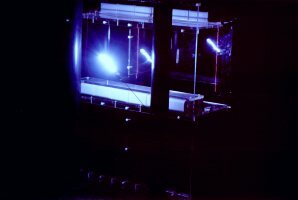 Below are images of some of our Tesla Coil systems and other electrical devices in action. 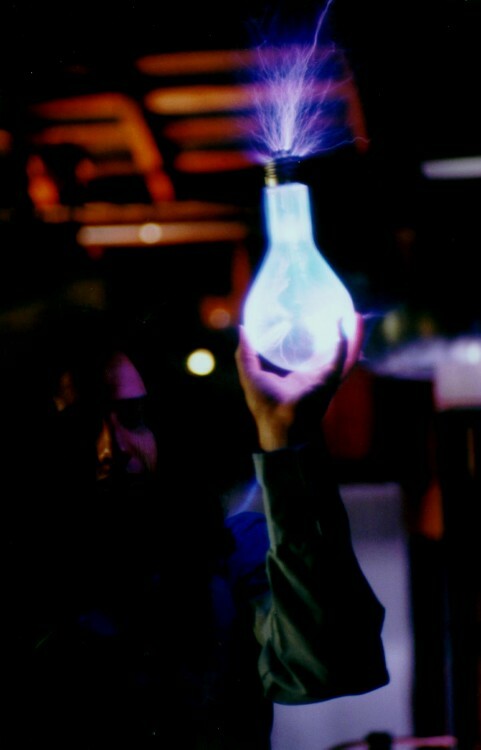 Click on any of the photographs to see a larger version. 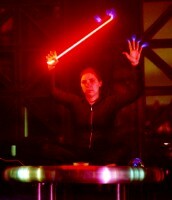 Please do not use or reproduce any photos without our permission. 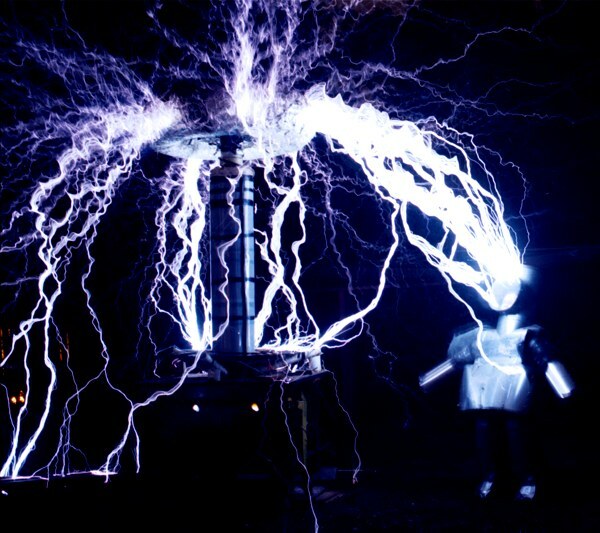 Above left: A performer inside of a metal suit that is struck by arcs from a large Tesla Coil. Above right: A performer on an insulated platform that is wired to the top terminal of a Tesla Coil. 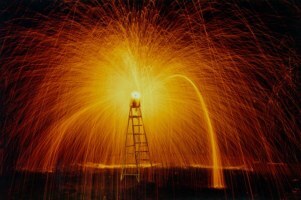 Above left: An interesting fiery effect created by one of our electrical devices. Above right: A torch wired to an insulated platform that in turn is wired to the top terminal of a Tesla Coil. 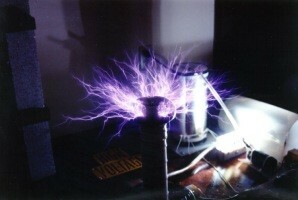 Above left: Air is ionized and glows between the top terminal of a Tesla Coil and a grounded rod. 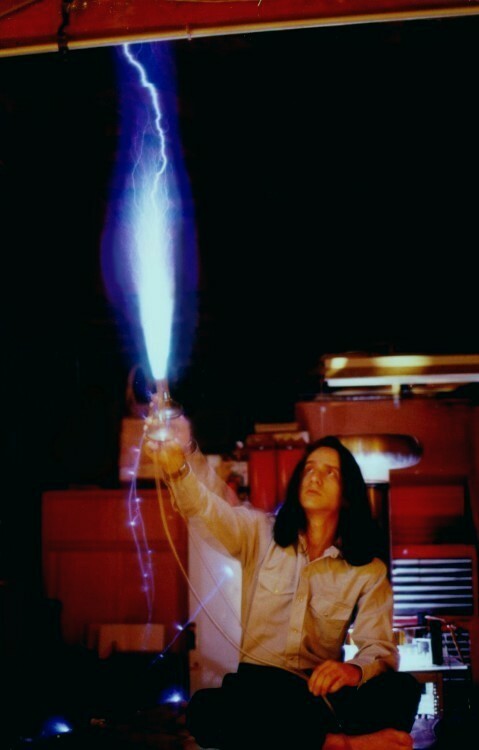 Above right: A performer draws an arc from a Tesla Coil to show scale and to demonstrate safety. 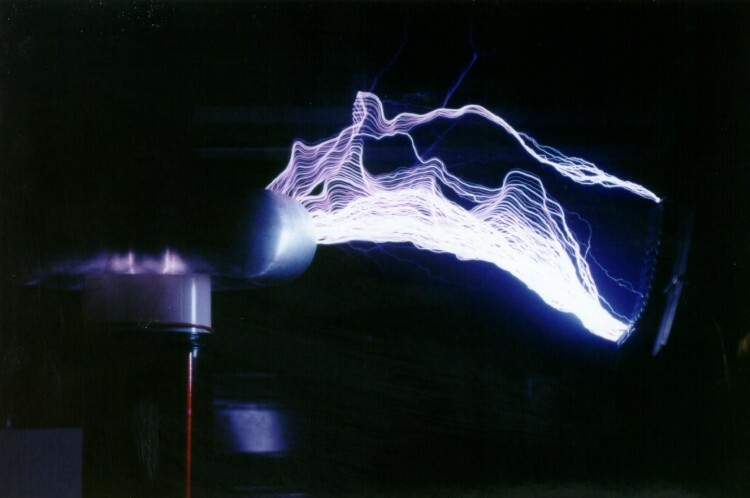 Above left: A prototype Model S-5 Tesla Coil producing arcs 5 feet (1.5 meters) in length with 2kW input power. Above right: The output waveform from the secondary coil of a Model S-5 Tesla Coil displayed on an oscilloscope (full scale is 2 milliseconds). Above: Our prototype Model S-15 Tesla Coil stands 11 feet (3.4 meters) tall and produces point to point arcs greater than 15 feet (4.5 meters) in length with an input power of 12kW. 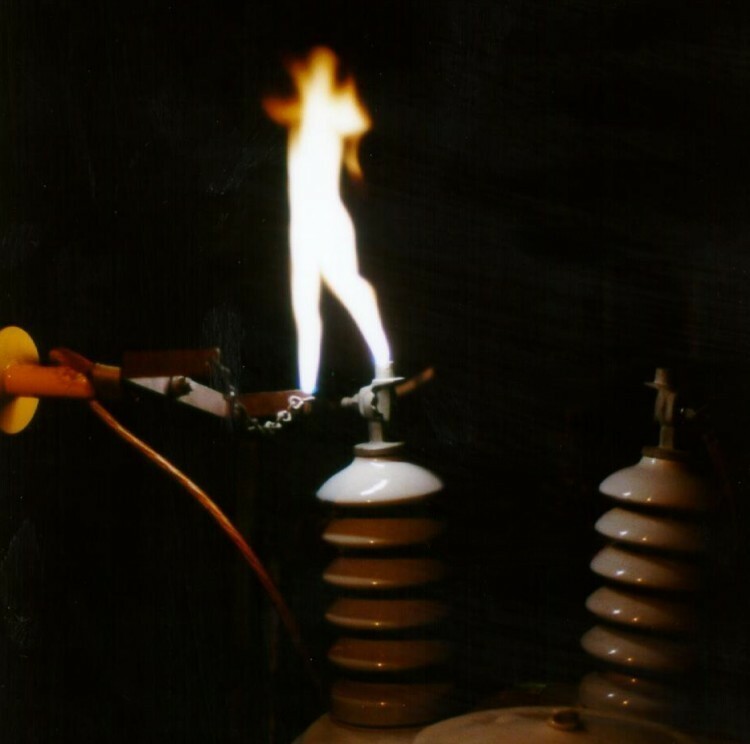 Above left: An arc is drawn from a 10kW distribution transformer. Above right: A Jacob's Ladder powered by a 10kW transformer. 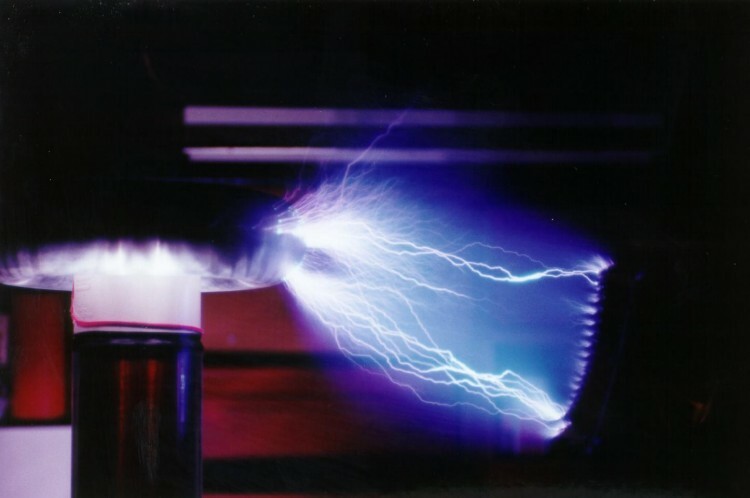 The arc rises between the wires because it creates ionized, heated air that is more conductive than the surrounding cool air. 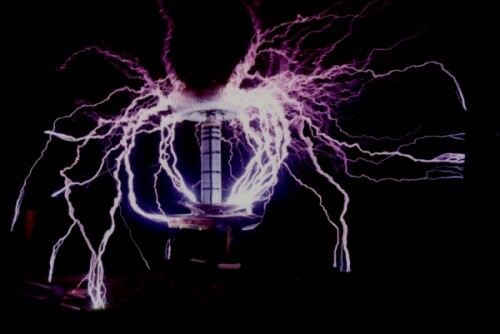 The heated air rises, and the electricity continues to arc through it until the air passes above the wires or is disturbed by wind. 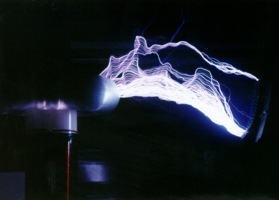 Above left: A small Tesla Coil producing one-foot (30cm) arcs with <300W of input power. 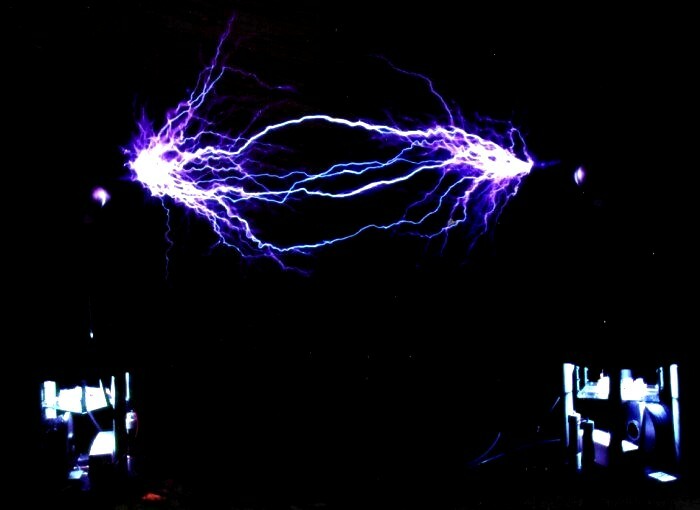 Above right: A 4.8kW bipolar Tesla Coil (Model SD-8) producing point to point arcs approximately 8 feet (2.4 meters) long. 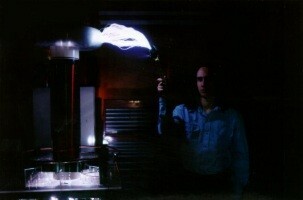 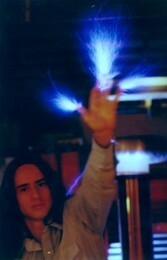 Above: A performer sitting with his hands raised on an insulated platform that is wired to the top terminal of a Tesla Coil. Arcs are emitted from the furthest points away from the platform, which in these cases are the performer's hands. If metal gloves are worn, arcs as long as several feet or more can be emitted. 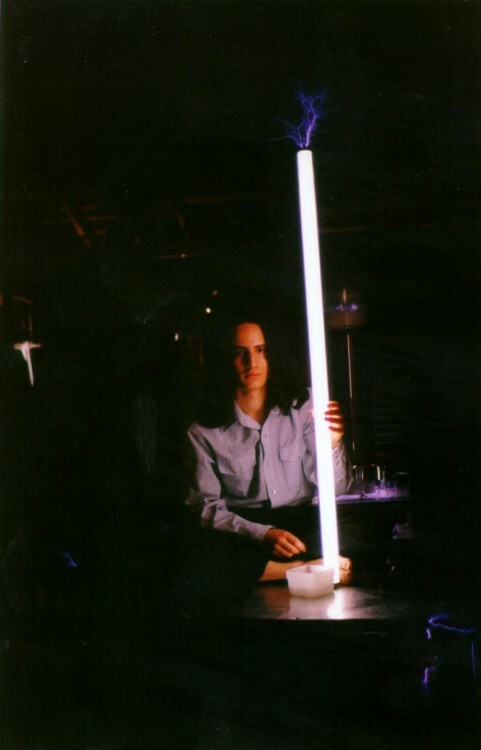 Above: Arcs are emitted from different types of light bulbs which are being held by a performer sitting on an insulated platform that is wired to the top terminal of a Tesla Coil. 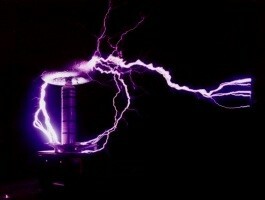 Above left: Arcs jump between a grounded rod and an insulated platform that is wired to the top terminal of a Tesla Coil. 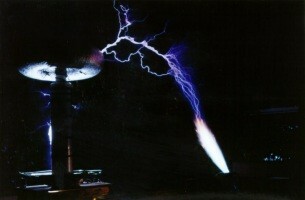 Above right: Arcs jump between a grounded rod and a Tesla Coil. 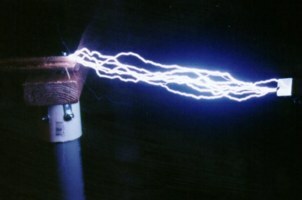 Rather than one solid arc being visible, there are actually many separate but similarly shaped arcs layered vertically. 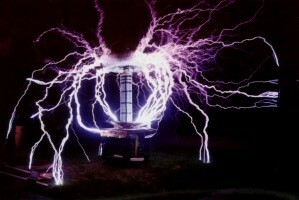 This is because the arcs from a Tesla Coil are not continuous but usually pulse hundreds of times per second. 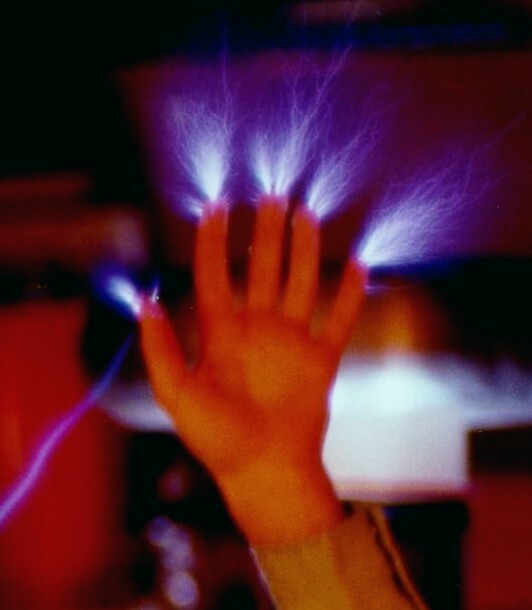 Light is only emitted during the pulses. 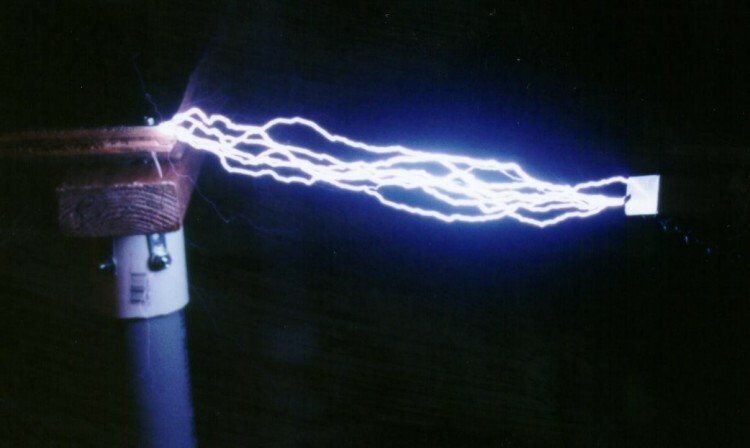 Each pulse of electricity ionizes and heats the air that it travels through. 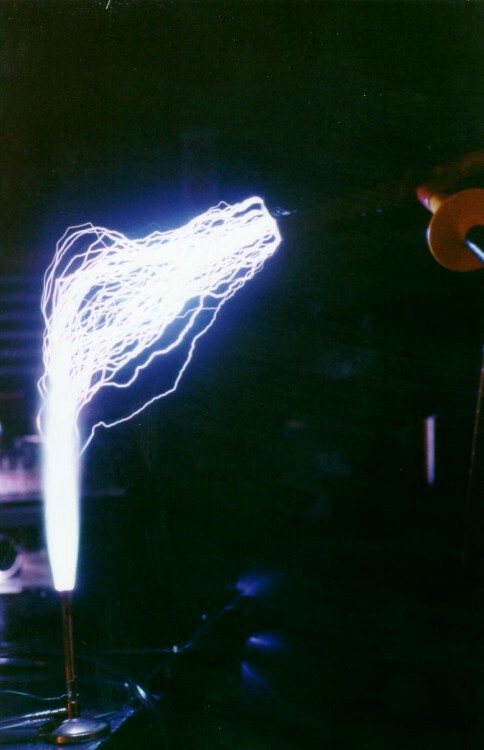 This heated air is more conductive than the surrounding cool air and therefore later pulses of electricity tend to travel through the same heated trail of air as it rises. 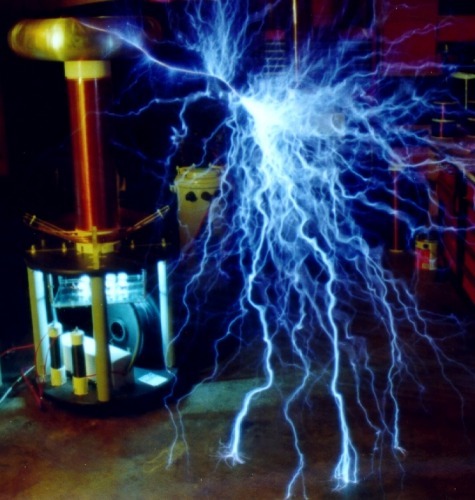 Above left and middle images: A torch wired to an insulated platform that in turn is wired to the top terminal of a Tesla Coil. 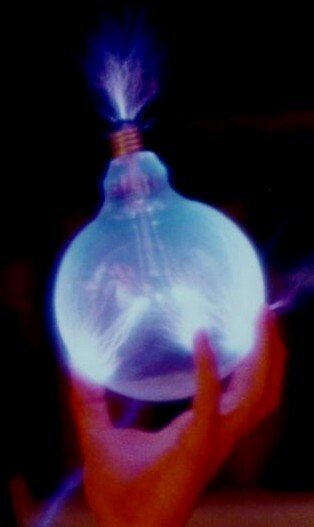 Since the flame and its exhaust are very hot, it is much more conductive than the surrounding air and arcs break out through the flame. 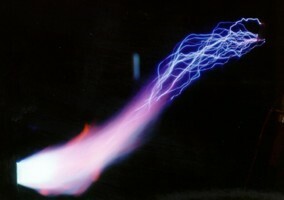 Above right: Arcs travel between a large Tesla Coil and the hot exhaust trail of a powerful torch. 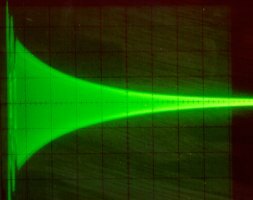 Above: A relatively low energy pulse discharge (100 Joules) from the first stage of our prototype Marx Generator.